Moline Creative facilitates creative brainstorming, decision-making, strategic planning, and change processes. Angie Moline, Ph.D. works with teams to clarify their goals, agree on the current reality, envision the future, and create a plan for implementation. She uses visual process techniques, such as concept mapping, visual note-taking, and custom graphic templates, when meeting with individual clients and teams. FAQ: What is the difference between meeting facilitation and process facilitation? 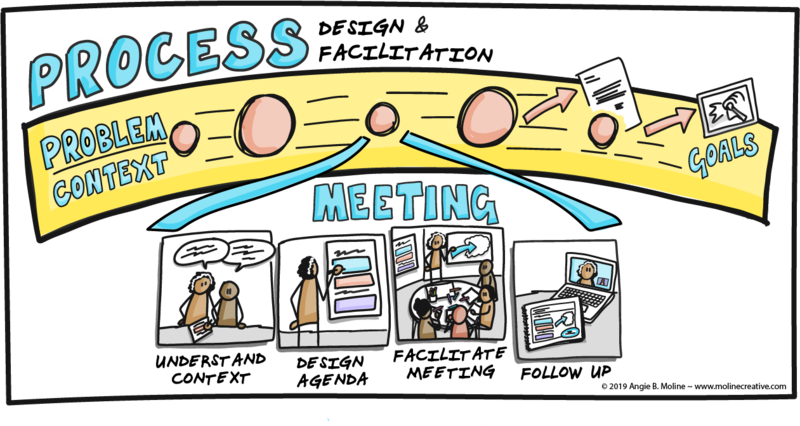 Basically, meetings are short, focused, and relatively discrete whereas processes tend to be longer, more exploratory, and often build towards a goal that is initially unclear. To decide on a strategy for.. Ideally the meeting attendees support the goal and enter the meeting with a good sense of what success will look like at the end of the meeting. The very best meetings are designed with this end goal (and sense of success) in mind. Everything that happens during the meeting supports this end goal. A process, on the other hand, takes place over a longer period of time. Often the goals and outcomes of the process are revealed by the process itself. There may be many meetings and multiple steps in a strategic planning or change process, for example. One advantage of hiring Moline Creative as a neutral, external process facilitator is that we will do background research to understand the context, stakeholders, and goals of your organization. Occasionally during the meeting preparation process, we learn that there are issues that were previously unknown or ignored. Once these issues are uncovered, the client can choose to expand the scope of the facilitated process to address these issues, shift the focus, or limit the scope of the meeting in order to buy time to work on unresolved issues. FAQ: Should I hire Moline Creative for meeting facilitation or process facilitation – or both? It depends! If you already have a meeting that has a clear goal, a list of attendees, and an agenda, you probably only need meeting facilitation services. However, if you have a complex problem that you aren't sure how to solve, we should talk and figure out how Moline Creative can help you.